Hi friends! 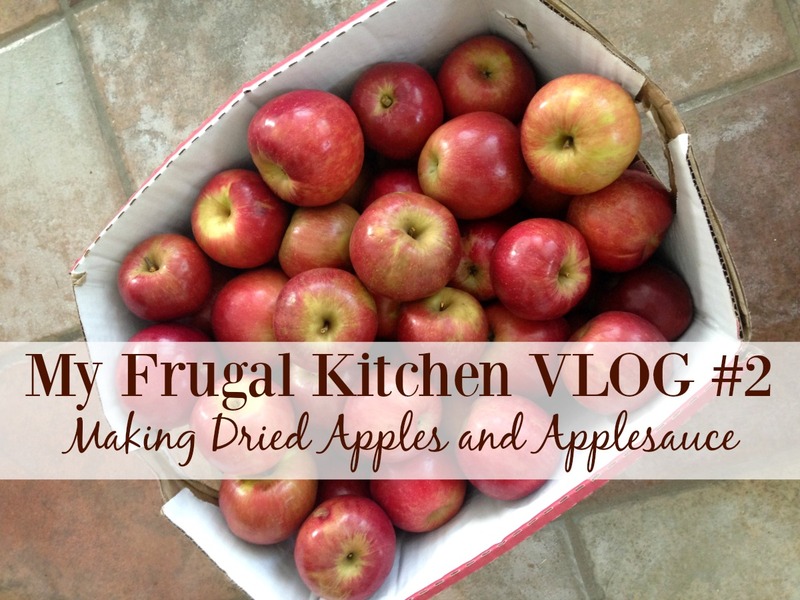 I was able to post a new My Frugal Kitchen VLOG this week over on my YouTube channel. I think I’m really going to enjoy making videos like these because they keep me accountable to get stuff done in the kitchen. If you aren’t familiar with this series, it’s basically where I make a VLOG (i.e. a “video blog”) of what I’m doing in the kitchen to save money and preserve the harvest. I love seeing how other people do things and so I hope by sharing these videos you can learn a few tips and tricks along the way with me. This week’s VLOG is all about apples. I went to a local apple farm last week and picked up a bushel of apples to preserve. We planted two apples trees on our property last year, so I’m looking forward to the day where I can pick my own, but I’m grateful to have local apples to buy for now. I bought a 1/2 bushel of #2’s (the one’s with small spots and bruises on them) for $10 and I got another 1/2 bushel of #1’s for $18. I made applesauce and dried apple slices with the #2’s and I plan on making apple preserves with the #1’s. My kids love applesauce and so I plan on going back in a couple weeks for more. Check out the video for more details about what I did with the apples and also check out some of my favorite apple recipes below. Lastly, I would LOVE it if you would subscribe to my YouTube channel so you never miss a video! Thanks for letting me know! I have a Nesco dehydrator and I like it. I wouldn't say it's top of the line, but it works well enough for me.